I hate the sound of popping balloons. I think most people don’t like it when balloons are popped by surprise. After all, it kind of sounds like a gunshot. 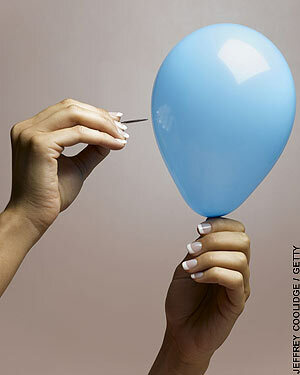 Most people especially don’t like it when the balloon breaks while they’re blowing it up, because that can sting. But I don’t like the sound even when I’m prepared for it. Hell, even when I have my hands over my ears. It sends a shiver down my neck and into my spine. As a kid my parents had a game for one of my early birthday parties (or maybe it was some other kid’s party, who’s to know?). Anyway, we filled these huge black garbage bags with dozens of balloons and have a contest to see who could break all the balloons the quickest by sitting on the bag (a contest at which I’d probably be a champion these days). I don’t remember if I joined in or held back, but either way this might have been the moment the aversion started. So the little red haired girl has to pop all the balloons in the house. And she does, because she’s my wife and she loves me. But she does tend to laugh every time. Interestingly, I don’t mind popping bubble wrap, in fact like all warm blooded Americans I kinda get a kick out of it. Go figure.